HONG KONG, Mar 7, 2019 - (ACN Newswire) - Blockpass IDN Limited has announced the addition of IDEX to its extensive roster of partners. IDEX is an Ethereum-based decentralized exchange that features Ethereum and ERC20 token trading pairs. IDEX provides traders with both smart contract security and real time trading experience providing the speed of centralized exchanges combined with the security and auditability of the Ethereum Blockchain. Blockpass is a digital identity application and service which brings control back to the user. Blockpass provides a streamlined and cost-effective user onboarding process for regulated industries and any kind of online service. From the Blockpass Application, users can create, store, and manage their data-secure digital identities that can be used for an entire ecosystem of services or token purchases. IDEX and Blockpass will work together to promote compliance within the realm of the blockchain ecosystem. In a sector that is increasingly under harsh scrutiny, blockchain based businesses need now more than ever to work to be compliant with new and emerging regulation. The partnership between Blockpass and IDEX will work with blockchain-based businesses to implement premium KYC and AML identity verification, ensuring the highest standards of compliance. 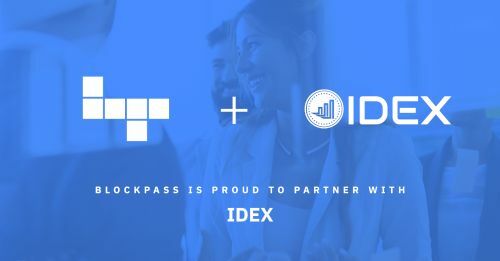 "The partnership with IDEX is particularly compelling for us," said Blockpass CEO Adam Vaziri. "We look forward to collaborating with IDEX to bring the best in class KYC Connect Solution to blockchain businesses around the world." "Blockpass helps reduce the KYC barrier for both businesses and customers by providing a single source of verified documents," said IDEX CEO Alex Wearn. "By integrating with a 'one and done' KYC solution we can ease the process of creating verified accounts on IDEX." IDEX is a hybrid, semi-decentralized exchange that provides a trustless, real-time, high-throughput trading experience in conjunction with blockchain based settlement. IDEX is the first in a suite of products from Aurora Labs, a startup working to build a distributed banking and investment platform. IDEX will be leveraged to bootstrap distribution and usage of the boreal - Aurora's price-stable cryptocurrency. Backed by a combination of cryptocurrency reserves and debt, boreals are accepted at their target value as payment for IDEX trading fees, and eventually by other partner services within the growing dapp economy.